ZorroVPN is a Belize-based VPN service that is focused heavily on privacy and advanced online anonymity features. These features include multi-hop VPN chains, strong encryption, and the ability to use custom VPN configurations with the Tor network and secure proxies. The main drawback (for some) is that ZorroVPN does not offer any custom applications, which means you will need to use third-party apps and setup will be more complex. We’ll show you exactly how to do this below. The other drawback is that ZorroVPN is on the higher end of the pricing scale. Is it worth it? Read on to find out! Get 11% off any subscription with ZorroVPN. While the price is on the higher end of the spectrum, ZorroVPN offers you the ability to combine VPN chains, the Tor network, and proxies together in custom OpenVPN configurations. No other VPN offers all these features together. Additionally, these features can be used on all major platforms, from computers to Android, iOS and even routers. For comparison, Perfect Privacy (review) also offers the ability to create multi-hop VPN chains with up to four different servers. It is about the same price as ZorroVPN, but multi-hop VPN chains are limited to Windows and Linux using their VPN Manager app. Payment options – ZorroVPN offer many payment options: PayPal, Perfect Money, Credit Cards, Bitcoin, Litecoin, Dash, and others. Anonymous payment is also easy. You don’t need to provide your name and can pay with cryptocurrency (Bitcoin, Litecoin, Dash, Monerro and others). Refund policy – ZorroVPN offers a clear-cut 7 day refund policy if you’re not satisfied. There are no hidden clauses or bandwidth restrictions. See the website for more details. The company behind ZorroVPN is Network Octet Ltd., which is based in Belize. Belize appears to be an excellent jurisdiction for privacy. It is an independent country without ties to any major surveillance states, such as the UK or US. As they explain on the website (under News), ZorroVPN moved the company (switched jurisdictions) from Seychelles to Belize for “providing a better level of privacy and confidentiality for our customers.” They announced this change in June 2017. ZorroVPN also maintains an updated warrant canary on their website (see FAQ > Technical questions). This officially certifies the safety of customer data and the independence of the company from third-party influence. It is clear they take the privacy of their customers very seriously. ZorroVPN does not offer any of its own apps. Instead, it is built to be used with third-party and open-source applications. For those who want custom VPN apps, this may be a drawback. To others, it is a benefit because most proprietary VPN apps don’t work well. Furthermore, third-party apps are often more secure and stable with regular updates. ZorroVPN is built to support all major platforms and devices, despite not having any of its own apps. ZorroVPN is unique because it’s focused on providing you with features to attain the maximum level of online anonymity. Only OpenVPN AES 256-bit – ZorroVPN only uses OpenVPN AES-256 bit encryption with 4,096 bit authentication. This is the gold standard for privacy and security – the highest level of encryption available. And because it’s OpenVPN, it provides you with both performance and security. ZorroVPN makes it easy to combine the VPN with Tor (anonymous network) for maximum anonymity. You can create a configuration where all your traffic first goes through the VPN and then onto the Tor network. 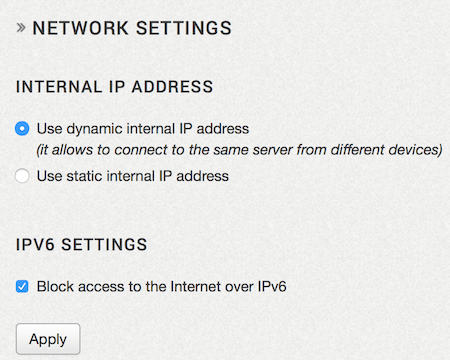 You can set this option up on any VPN server. Simply choose the Tor network as the exit node. It’s also easy to create a multi-hop VPN “chain” with up to four different VPN servers. 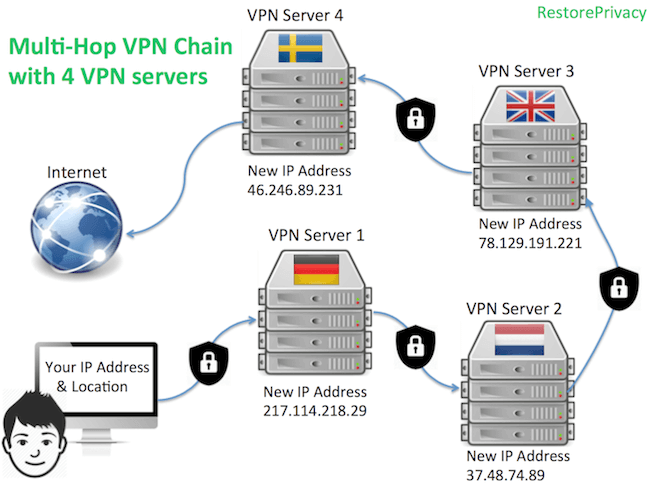 By creating a multi-hop VPN chain, the IP address associated with your device is replaced at every consecutive hop. In a world of mass surveillance and powerful state actors, it’s not crazy to assume that VPN servers are being monitored for incoming and outgoing IP addresses and traffic. Creating a multi-hop VPN chain, you will replace your IP address and re-encrypt your traffic across multiple servers – giving you even more anonymity with each consecutive hope. For more of a discussion on multi-hop VPN chains and why they are crucial for online anonymity, see this guide. ZorroVPN also provides you with the ability to use a VPN in combination with a proxies, both before and after the VPN server. For even more online anonymity, you can create a chain of up to four VPN servers, with the last server exiting onto the Tor network. When you also consider that ZorroVPN is using OpenVPN AES-256 bit encryption with 4,096 bit authentication, it becomes clear how strong this setup is. While performance will not be great (due to increased latency plus the Tor network), this setup is about as anonymous as you can get. Finally, you could also utilize numerous VPN chains at the same time. Example 1: First, create multi-hop VPN chain to be used on your router. Then connect to that router using a multi-hop VPN chain on your computer. Example 2: Utilize a multi-hop VPN chain on your computer, and then run another multi-hop VPN chain within a virtual machine. ZorroVPN currently has servers in approximately 80 different locations in 51 different countries. You can see the different locations on the website. Because ZorroVPN doesn’t dump most of their resources into marketing and creating apps, they can focus their energy on providing a secure, fast, and reliable server network. This is the backbone of any VPN service, and the most important feature to closely examine. In testing out different server locations, I found their network to be very fast and reliable. I didn’t experience any connection issues or speed problems. I also tested many of their servers to verify the true location, using this guide. Every server checked out and I did not find any fictitious locations. Everything worked well without any issues. However, Viscosity appears to be the best option for Windows and Mac OS users. It is a premium third-party VPN application (cost is $9) that’s been around for a while and works very well. Viscosity also offers more features and customization options than Tunnelblick or the Windows GUI. If done correctly, using a VPN together with the Tor network can give you a very high level of anonymity. With most VPNs, this setup can be difficult and risky if not done correctly. With ZorroVPN, you can easily create a VPN + Tor chain and then import the configuration into your VPN app. First, select which VPN servers you want in your VPN chain. 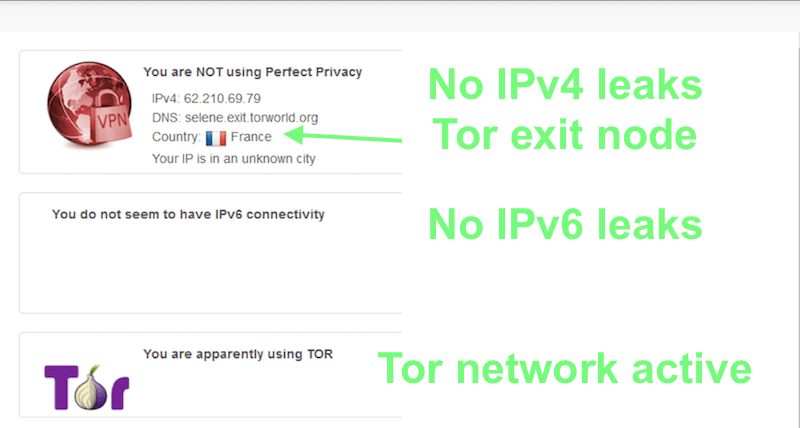 Then select Tor as the exit node on the last server, and finally download/import the configuration. After you import the configuration file, it will be saved for later use in your VPN application. Creating a custom VPN chain is fast and easy. Once you create the configuration you want, just download and import it into your VPN application. It will also be saved for later use. The configuration above is a chain with VPN servers in Germany > Netherlands > Belgium > Denmark. 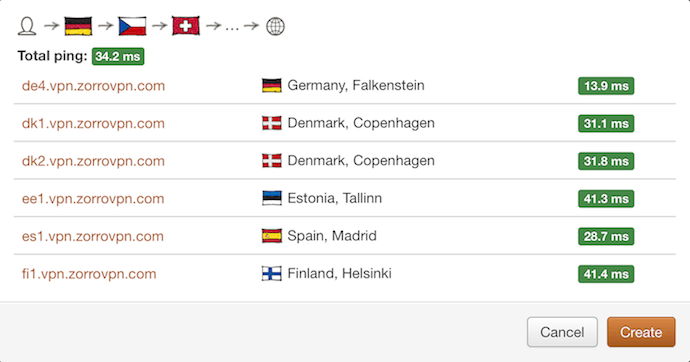 Then I selected the Denmark server’s exit node to be the Tor network, which added three more anonymous Tor hops (for a total of 7 different hops). Finally, I downloaded this configuration (as an OpenVPN file) and imported it into my VPN application. Note: All of this takes less than a minute – and once you’ve imported the configuration file, you can instantly connect to this chain/server setup with one click in your VPN application. 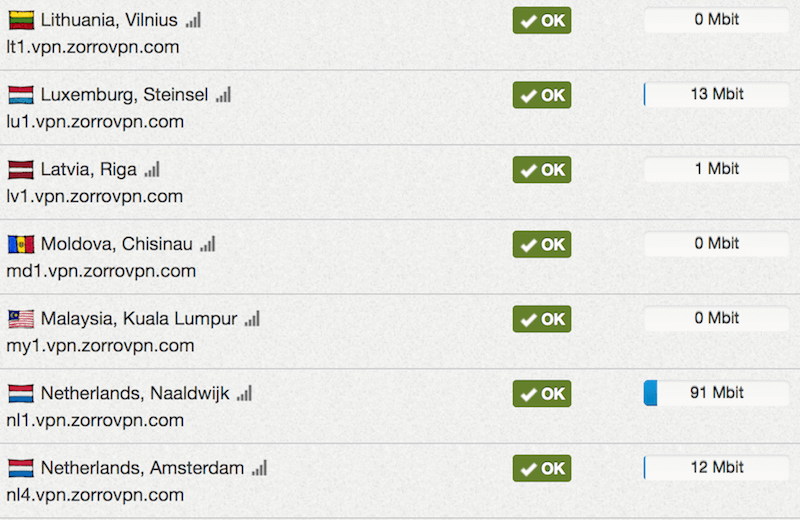 Testing results: Despite being more complex than your average VPN, every thing worked perfectly. ZorroVPN’s configuration wizard makes it easy to create the configurations you need. Using the Perfect Privacy IP check tool, I was able to test for IPv4 leaks, IPv6 leaks, and Tor connectivity all at the same time. As you can see below, my chain of four different VPN servers plus the Tor network (for a total of 7 hops) worked perfectly without any leaks. IPv6 leak protection – ZorroVPN provides IPv6 leak protection directly from the membership area, where you can configure your internal IP address, and also block IPv6 traffic. DNS leak protection – ZorroVPN provides clear instructions on their website for setting up DNS leak protection. You can manually configure DNS leak protection settings on your computer or setup DNS leak protection within Viscosity. Either method should work well – but always test to make sure. No DNS leaks were found in testing numerous ZorroVPN servers. Conclusion on privacy and security tests: Running ZorroVPN through a number of tests did not find any problems – everything worked well. There were no leaks and all the features functioned as they should. All of the ZorroVPN servers tested in this review provided excellent speeds and reliability. You can get real-time server load information directly in the members area of the website. As you can see below, ZorroVPN has excessive bandwidth available on their network (unlike some of the larger VPN providers that oversell their servers). This gives you the best speeds and reliability possible. This is excellent bandwidth (servers not overloaded). The speeds achieved with ZorroVPN’s multi-hop cascade feature are also impressive. Datacenter to datacenter transmissions can be very fast, so you don’t necessarily have to sacrifice speed for more privacy/security. Just keep in mind that long distances between hops will reduce your speed no matter how fast the servers are. Here is one speed test while connected to a server in Dusseldorf (Germany) using the Tunnelblick app on Mac OS. Speed testing results with ZorroVPN were excellent. Regarding a VPN chain with Tor, the main thing to remember is that the Tor network will always be relatively slow. Using Tor with a VPN chain will give you more anonymity, but you will sacrifice some performance. Overall, for the best mix of performance and anonymity, a double or triple hop VPN chain with nearby locations is a good choice. ZorroVPN is a no logs VPN service. ZorroVPN provides fast and professional customer support. They offer many different support options: email, chat, Skype, Teamviewer, and even Twitter. I sent the support department a number of general questions during the daytime and typically received a response within 20-30 minutes. On the website they emphasize how willing they are to help their customers with setup and configuration – I found this to be accurate. If you want to give ZorroVPN a try, the first thing to do is go to the ZorroVPN website and select a VPN subscription length. As with most VPNs, the longer the duration, the cheaper the monthly rate will be. You can use the 11% off discount on any plan duration. Just enter the discount coupon RESTOREPRIVACY when you place your order. Use the discount code RESTOREPRIVACY for 11% off any subscription period. After completing the purchase, you’ll get an email with your subscription details. After you receive the confirmation email, go to the website and sign in to the members area. From there, you can download software to use ZorroVPN on up to 5 different devices. If you’re using ZorroVPN on Windows or Mac OS, you may want to try the Viscosity VPN app. You can download the latest version directly from the ZorroVPN client area, and then test it out for 30 days for free. Viscosity is a great VPN app for Windows and Mac OS. 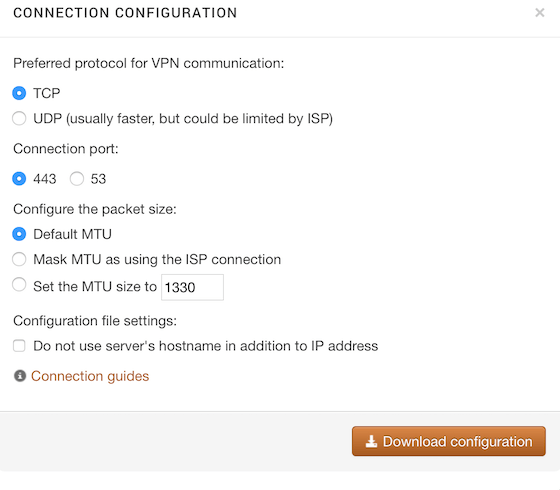 To import a server configuration file to your VPN client, you can choose between UDP or TCP, which port to use, as well as MTU packet size. To create a VPN chain with fast speeds, ZorroVPN’s configuration tool will show you the added ping for every hop. This helps you optimize performance. It may take some time to get everything configured and setup properly, but after that, using ZorroVPN is fast and easy. ZorroVPN earns a strong recommendation based on extensive testing and analysis for this review. They offer a very high-quality VPN with maximum security and anonymity features, without all the annoying marketing and tacky slogans. Some people might want a VPN that provides their own applications. If that’s the case, Perfect Privacy may be worth considering because they also offer multi-hop VPN chains, numerous features (including a great ad blocker), and their own applications for Windows and Linux. But ZorroVPN should also not be dismissed. It has many unique benefits that separate it from an overcrowded market of mediocre VPNs. If you are looking for a powerful VPN to provide you with the highest level of online anonymity on all your devices, ZorroVPN is good choice. 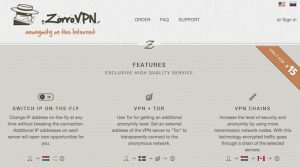 If you have used ZorroVPN, feel free to share your honest review (good or bad) below. Just signed up with ZorroVpn and previously i had VPN.AC. Its always good to have multiple VPN and i subscribe to both service after reading the review here. I am impressed with both services and personally comparing to VPN.AC, ZorroVpn feels smoother when downloading and streaming contents. I also find the OpenVPN AES 256-bit to be very secured and safe. 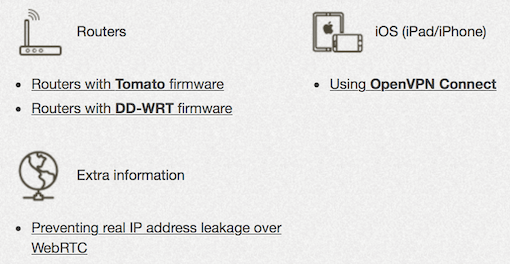 Configuring the OPENVPN app is also very easy if you follow the instruction on the online manual. Will highly recommend to whoever is thinking of signing up with ZorroVPN.